Ulster rallied to a first bonus point win of the Guinness PRO14 season, scoring five tries in a deserved win over Dragons at Kingspan Stadium on Friday night. Having lost and drawn their previous two PRO14 games before moving into Europe and the Champions Cup, Ulster got back to winning ways and climbed two places in Conference B with an at times impressive performance over the Welsh side. It was an energetic start from Ulster, the mixture of experience and youth keen to make an early impression on the return to the Guinness PRO14. And the home side stamped their authority early on with a penalty through outhalf Johnny McPhillips, making his first start in the number 10 shirt this season. It remained one way traffic, with Henry Speight just missing out on a crossfield kick and Ulser then having a lineout turned over close in. Fullback Mike Lowry showed a lovely turn of pace to steam through the middle of the park, but he just gave the ball to Speight too early and the opportunity went abegging. However, Speight, back from injury picked up in late September, was not to be denied and he went over for the opening try of the game after 11 minutes, McPhillips putting Ulster 10-0 ahead. The Welsh visitors enjoyed some rare time in the Ulster half and a penalty opportunity on 16 minutes was too good to turn down, outhaf Jason Tovey popping it over. Debutant Robert Baloucoune got an opportunity to stretch his legs, before another piece of magic from Lowry saw him jinx through the cover and it looked as if he was away for the try. But Tovey’s tap tackle was enough to halt him. 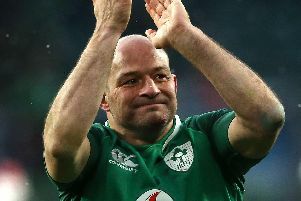 On 23 minutes, Will Addison showed exactly why Ireland head coach Joe Schmidt gave him a first call to the Ireland squad. The centre turned and twisted his way through and gave the perfect pass to send scrumhalf Dave Shanahan away for a try. McPhillips again converted and Ulster had stretched the lead to 17-3. But the home side seemed to lose concentration for a period and the Dragons came right back into the game, the deserved pressure rewarded with a try for backrow Huw Taylor, converted by Tovey who also added a penalty to leave things tighter than the balance of play would have suggested. But Ulster went into the break with a 24-13 lead after Lowry finished off another inventive break out from the hosts, and McPhillips converted. There was early pressure from the hosts at the start of the second half and after good forward penetration on the left, the ball was moved right and the gap opened, allowing centre Stuart McCloskey to go in for the bonus point securing fourth try on 49 minutes..
McPhillips missed for the first time on the evening, but the Ulster lead was looking much healthier. Ulster had emptied the bench, most tactical although it was disappointing to see Lowry forced off with an injury. The Dragons then enjoyed another purple patch, really turning the screw up front and the hosts were found wanting. After one score was chalked off for a knock-on and a second charge over the line held up, the Welsh side eventually got rewarded - aided by some disappointing defence from Ulster - centre Jared Sage going over from close range for an unconverted try. The Dragons pressed hard in the closing minutes, looking for a score to salvage a losing bonus point at least, but a galloping break from an Ulster turnover by Kieran Treadwell saw him go clear and McCloskey was on his shoulder to go over for the try., McPhillip's conversion took the last bit of wind out of the visitors sails and secure a deserved victory. There was one last flurry from the hosts, replacement prop Andy Warwiick breaking through but just unable to find the extra bit of gas needed to get over the line.